Ample epigraphic testimony about the antiquity of the temple is available and has been collected and published by the Tirumala Tirupati Devasthanams. The temple itself is believed to have existed from very ancient times and it is said Sri Venkateswara is referred to even in the Rigved. 'Sri Venkatachala Mahatmayam' contains Puranic lores form the twelve Mahapuranas. The puranic legends say that after the Pralaya kalpa preceding the great Deluge, the Supreme Being Maha Vishnu, revealed Himself in the form of a White Boar, Sweta Varaha, rescued the earth and recreated it and having re-established the universe, He decided to stay on the earth for some time to protect the good and destroy the evil. Thus God Vishnu revealed Himself earlier, in the previous incanation as Varahaswami on the bank of the Varaha Tirutham i.e., northern portion of Pushkarini at Tirumala. This manifestation as the White Boar is enshrined in the Adj Varahaswami temple on the Northwestern bank of the Pushkarini at Tirumala. 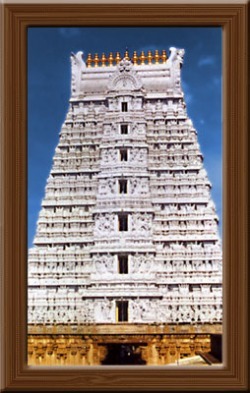 This temple is believed to be older than the temple of Lord Venkateswara and claims precedence in worship and Nivedana. There are many more legends about the Venkatachala Hills and Lord Venkateswara in The Varaha and Bhavishyottara Puranas. The meritorious benefits acquired by a pilgrimage to Venkatachala are mentioned in the Puranas and Sri Venkateswara is described as the great giver of boons. References to the temple seems to be a hoary one, all the great dynasties of rulers of the southern peninsula have paid their homage to this ancient shrine. The Pallavas of Kancheepuram (9th century A.D.) Cholas, Padyas and the kings, chiefs of Vijayanagar (14th -15th Century) were devotees of Lord Venkateswara and they vied with each other in endowing the temple with rich offerings and benefactions. It was during the Vijayanagar dynasty that; the number of benefactions increased. The statues of Sri Krishna Devaraya and his consorts were installed in the temple at the portals, in his own life-time and they can be seen even today. There are also statues of Achyuta Rava and Venkatapati Raya. Sri Krishna Deva Raya visited the sacred shrine seven times with his consorts during his reign. After the decline of the Vijayanagar dynasty the nobles and chieftains from all parts of the country continued paying their homage and gifts to the temple. The Maratta general, Raghoji Bhonsle, visited the temple and set up a permanent endowment for the conduct of worship in the temple. He also presented valuable jewels to the Deity, including the great emerald which is still preserved in a box named after him. Among the later rulers who have endowed large benefactions are the rulers of Mysore and Gadwal. After the fall of the Hindu kingdoms, the rulers of Karnataka and the Britishers stepped into their shoes and many of the temples came under their supervisory and protective control. In 1843 when the East India Company divested itself of the direct management of non-Christian places of worship and of native religious institutions, the administration of the shrine of Sri Venkateswara with a number of estates was entrusted to Sri Seva Dossji of the Hathiramji Mutt at Tirumala as Vichranakarta and for nearly a century, till 1933 the temple was under the administrative charge of the mahants. In 1933 by a special Act passed by the Madras Legislature, the Tirumala Tirupati Devasthanams Committee was invested with the powers of administration and control through a Commissioner appointed by the Government of Madras. This committee was assisted by a Religious Advisory Council in regard to religious matters and a Ryots Advisory Council in regard to the management of the estates of the TTD. To-day, T.T. Devasthanams which maintain 12 temples and their sub-shrines is a conglomerate of temples brought under the first schedule 2 of the Act 20 of 1987 enacted by Andhra Pradesh government. It is managed by a Board of Trustees appointed by the state government. The Executive Officer is the Chief Executive of the administration. He is assisted by two Joint Executive Officers, Financial Advisor and Chief Accounts Officer, Deputy Executive Officers, Security and Vigilance Officer, Conservator of Forests and Chief Engineer in various spheres of activity. Besides, there are other officials like Law Officer, Welfare Officer, Public Relations Officer, Marketing Officer, Educational Officer and others to look after several wings of administration.